In total, in excess of US$60m has been spent at Fort Cady, including resource drilling, metallurgical test works, well injection tests, permitting activities and substantial pilot-scale test works. Figure 1. 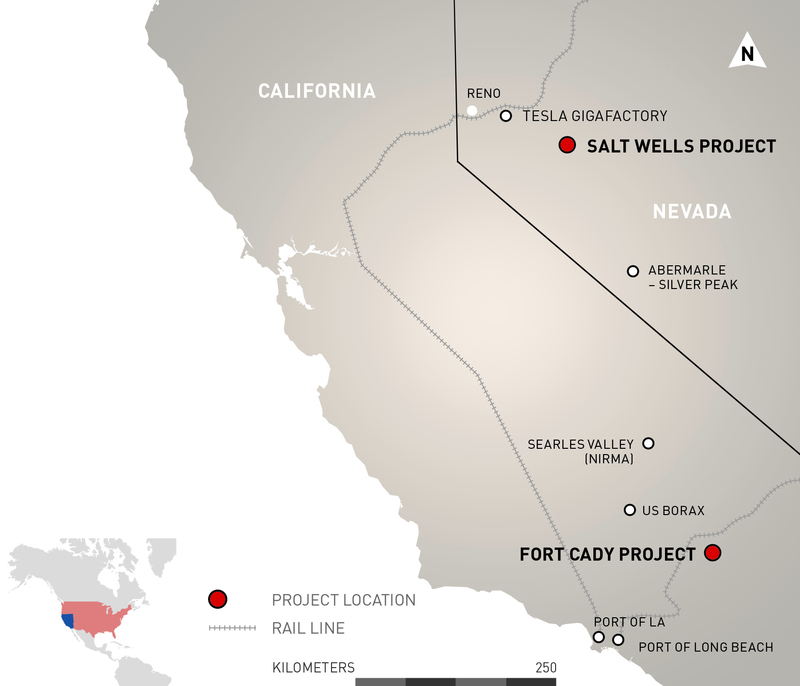 Location of Fort Cady Project in California, USA. American Pacific Borate delivered an exceptional Definitive Feasibility Study (DFS) in December 2018 and in January 2019 announced an enhancement to include a low capex starter project by splitting Phase One in to Phase One A and Phase One B. Following the passing of a new tax regime in the US, the Company’s financial metrics were improved as a result, increasing its key metrics to deliver a post tax, unlevered NPV10 of US$746.9m (A$934.7m) and an IRR of 41.1% for the targeted Base Case (Phase 2: 246ktpa boric acid and 54ktpa SOP). Table 1. Key Economic Outcomes from the Scoping Study (Post New Tax Regime in the US). In total, over US$50m has been spent on the Fort Cady project, including licence acquisition, drilling and resource estimation (non-JORC), well testing, metallurgical testing, feasibility studies and pilot plant infrastructure. In addition, the project has previously obtained all operating and environmental permits required for commercial solution mining operations. Duval Corporation evaluated the Fort Cady deposit in the late 1970’s and early 1980’s, completing over 30 diamond drill holes upon which the maiden non-JORC resource estimate was defined. An additional 17 production wells were completed in the following years which were used for injection testing and pilot-scale operations. Historical records from Mountain State Minerals that produced boric acid on site in 1986 and 1987 show the operations achieved an average boric acid head grade of 3.7% without heating injection fluids, recirculating pregnant liquor solution (PLS) to boost recoveries or utilising waste water containing residual boric acid. This historical information is important as Mountain State Minerals was using the same injection fluids the Company is proposing to use. Approximately 450 tonnes of boric acid was produced via solution mining of the colemanite ore body (Figure 2). Given the promising results of the pilot-scale tests, concentrated permitting efforts for commercial-scale operations began in early 1990. Final approval for commercial-scale solution mining and processing was attained in 1994. Extensive feasibility studies, detailed engineering and test works were subsequently undertaken in the late 1990’s and early 2000’s. This included a second phase of pilot plant operations between 1996 and 2001 during which approximately 1,800 tonnes of a synthetic colemanite product (marketed as CadyCal 100) was produced. Commercial-scale operations were not commissioned due to low product prices and other priorities of the controlling entity. ABR executed a Share Purchase Agreement with the project vendors (Atlas Precious Metals Inc.) in May 2017 to purchase 100% of the project. Figure 2. Fort Cady Site photo taken in October 2017 showing drilling activity, and pilot plant in the background. 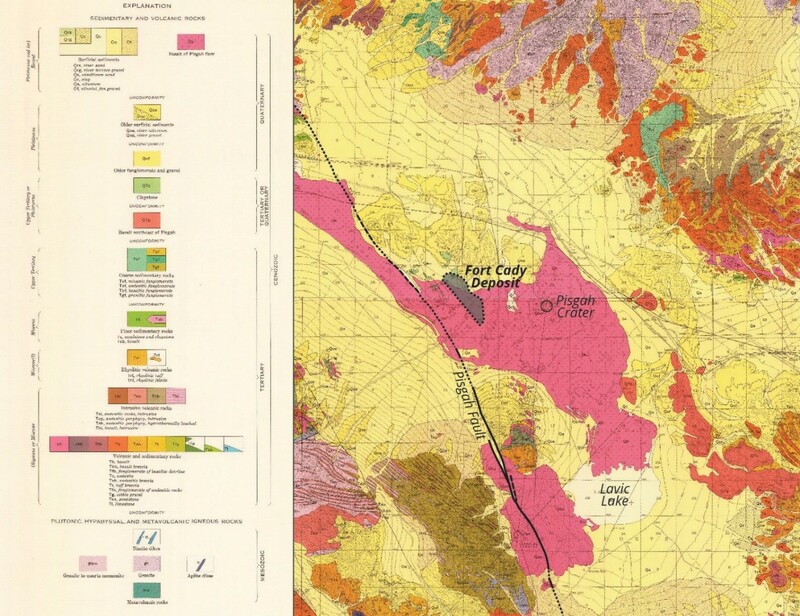 The project area is located in the Hector Basin of the Barstow Trough of the central Mojave. The Mojave comprises a structural entity commonly referred to as the Mojave block, and is bounded on the southwest by the San Andreas fault zone and the Transverse Ranges, on the north by the Garlock fault zone, and on the east by the Death Valley and Granite Mountain faults. The central Mojave region is made up of a number of relatively low mountain ranges separated by intervening basins which are floored primarily by alluvium. The central Mojave area is cut by numerous faults of various orientations but which predominantly trend to the northwest (Figure 3). The Barstow Trough, which is a structural depression, extends northwesterly from Barstow toward Randsburg and east-southeasterly toward Bristol. It is characterised by thick successions of Cenozoic sediments, including borate-bearing lacustrine deposits, with abundant volcanism along the trough flanks. The northwest-southeast trending trough initially formed during Oligocene through Miocene times. As the basin was filled with sediments and the adjacent highland areas were reduced by erosion, the areas receiving sediments expanded, and playa lakes, characterised by fine-grained clastic and evaporitic chemical deposition, formed in the low areas at the centre of the basins. Exposures of fine-grained lacustrine sediments and tuffs, possibly Pliocene in age, are found throughout the project area. Younger alluvium occurs in washes and overlying the older lacustrine sediments. The project area is covered by Recent olivine basalt flows from Pisgah Crater, which is located approximately 3.2 km east of the site (Figure 3 & Figure 4). Thick fine-grained, predominantly lacustrine mudstones appear to have been uplifted, forming a block of lacustrine sediments interpreted to be floored by an andesitic lava flow. Figure 3. 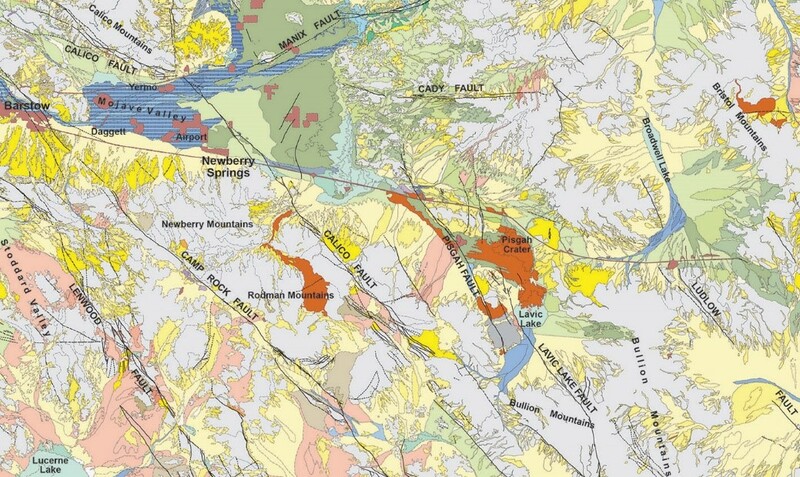 Geology and major structures in the Newberry Springs region. Fault B, an unnamed fault, located east of the ore-body. The Pisgah Fault is a right-lateral slip fault that exhibits at least 200m of vertical separation in the project area. The east side of the fault is upthrown relative to the west side. Fault B is located east of the ore body and also exhibits at least 200m of vertical separation. The borate ore body is situated within a thick area of fine-grained, predominantly lacustrine (lake bed) mudstones, east of the Pisgah Fault and west of Fault B. The central project area has been uplifted along both faults, forming an uplifted block. Test borings emplaced through the ore body reportedly show the presence of claystone at the base and around the evaporite/mudstone ore body. Exploration drilling in the project area indicate that the ore body lies between approximately 400m and 550m below ground level. The ore body consists of variable amounts of calcium borate (colemanite) within a mudstone matrix (Simon Hydro-Search, 1993). Figure 4. Geology map of project region (modified from Dibblee, 1967). In addition to ABR assessing the leachability of lithium from within the borate-bearing rock formation, the Company is assessing the sourcing lithium-enriched brines to use as leachate make-up water for solution mining and processing. Ambient brines within the borate ore body have previously been determined to contain up to 91ppm lithium which would be liberated as a function of solution mining. The Company is also assessing its land tenure for structurally hosted lithium-enriched brines towards the centre of the Hector basin. It is postulated that lithium-enriched brines would migrate in this direction during basin formation due to the high mobility of lithium ions. It is also postulated that repeated episodes of volcanism and associated hydrothermal processes have upgraded the lithium concentrations in ground waters (Figure 5). This has the potential to allow the Company to produce a lithium by-product stream from which lithium salts could be produced. Figure 5. Schematic east-west cross-section of the Fort Cady Project. Mining Conditional Use permit and Approved Reclamation Plan (issued jointly by the San Bernardino Land Use Services Department and the California Department of Conservation, Office of Mine Reclamation (refer Figure 6 below). The proposed action consists of the construction and operation of a borate production mine and process plant with the capability of producing 90,000 tons per year of borate product. 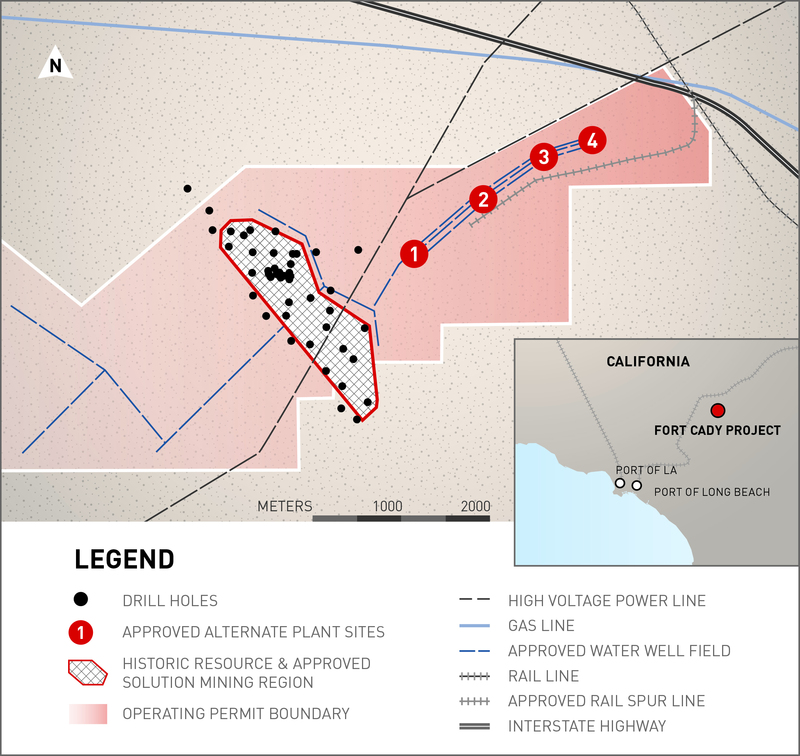 The proposed facility would employ in-situ mining technology to mine an ore body containing colemanite, a boron-bearing, hydrous oxide (Ca2B6O11. 5H2O) mineral. The recovery of boron from the colemanite mineral would be accomplished by injecting a weak acid solution (no more than five percent hydrochloric acid, sulfuric acid, or a mixture of both in a water solution) into the ore body. The acid would react with the alkaline nature of the ore body to recover a mixture of borate product and calcium chloride, which would be dissolved in solution as products of the chemical reaction. This solution would be withdrawn from the well and pumped to the process plant where borate crystals would be precipitated. The remaining formation would be a porous matrix of clays and insoluble minerals. The void space that would result from the leaching process would constitute less than 12 percent of the formation, and the void space would ultimately contain water, therefore subsidence is not expected to occur. Water pipelines, railroad spur and three access roads. In order to commence construction, the Company requires the reinstatement of the previously held air quality permit. In order to commence production, two additional water related permits must be obtained. The formal water related permit applications are expected to be lodged in Q4 2018 or early Q1 2019. The Company has been advised by retained legal counsel that this process should take between six to eighteen months from lodging. Importantly, discussions are ongoing with relevant referral authorities with respect to both the air and water permits. The Company is currently seeking to be fully permitted by the end of Q3 CY2019 and in a position to commence construction shortly thereafter, subject to financing. Figure 6. Map showing operating permit boundary, site options, in place infrastructure and resource. The project will employ in-situ solution mining. In-situ technology was developed commercially in the 1970’s and has been applied to the commercial production of uranium, copper, salt, potash and soda ash. The use of in-situ technology to mine boric acid from the underlying borate deposit on-site was developed on the Fort Cady property in the 1980’s. 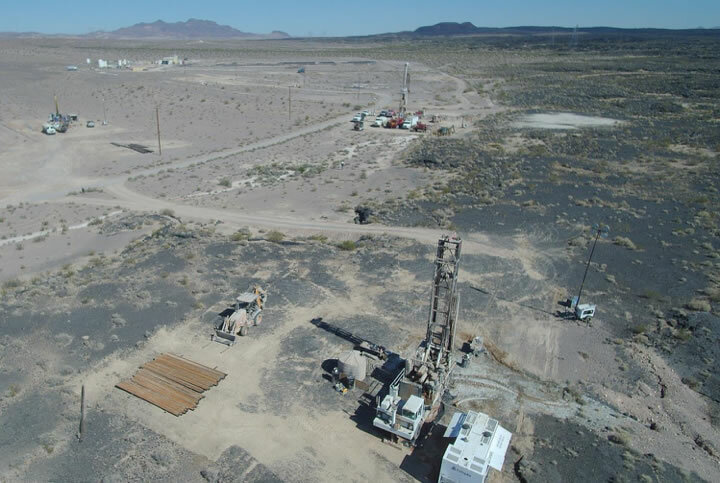 Searles Valley Minerals currently utilises the in-situ solution mining technique at its borates and soda ash mine approximately 140km northwest of the Project area. The pregnant leach solution then being extracted to the surface by a reverse-pumping process (Figure 7). Figure 7. 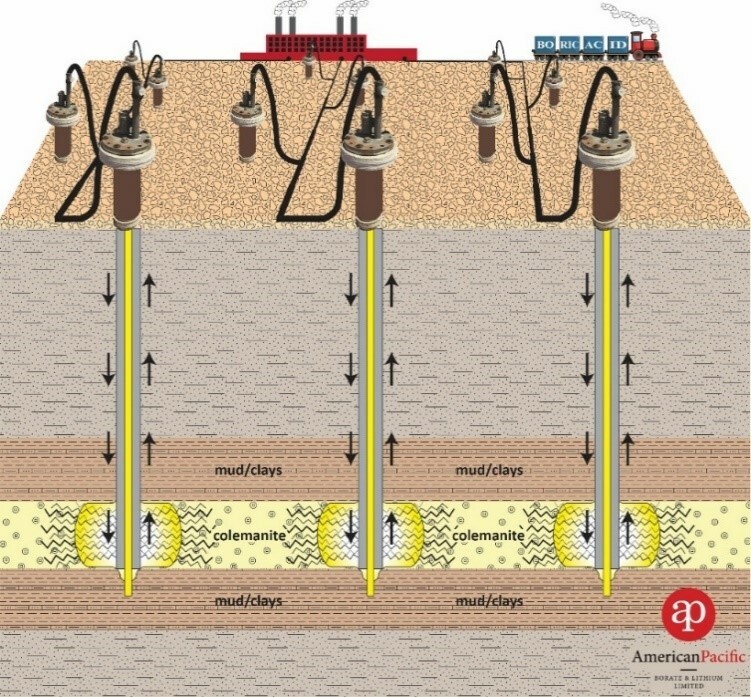 Schematic showing well field and solution mining production holes. The Company is in the process of optimising the process design for the Project. Current work programmes are building on the extensive amount of metallurgical and pilot-scale test work previously conducted on the Project. It is envisaged the optimised flow design will be broadly based on that utilised during the first pilot plant operation between 1986 and 1987. Following is a brief summary of the process design as envisaged by ABR. A simplified process flow chart is shown in Figure 8. In parallel with ongoing testworks, the Company is exploring options to sell by-product gypsum into the large Californian gypsum market. Figure 8. Simplified process flow chart for the Fort Cady Project. The project area is exceedingly well served by infrastructure. (Figure 9). The I-40 highway and the main BNSF rail line serving Los Angeles run alongside each other just 4km to the north of the project area. 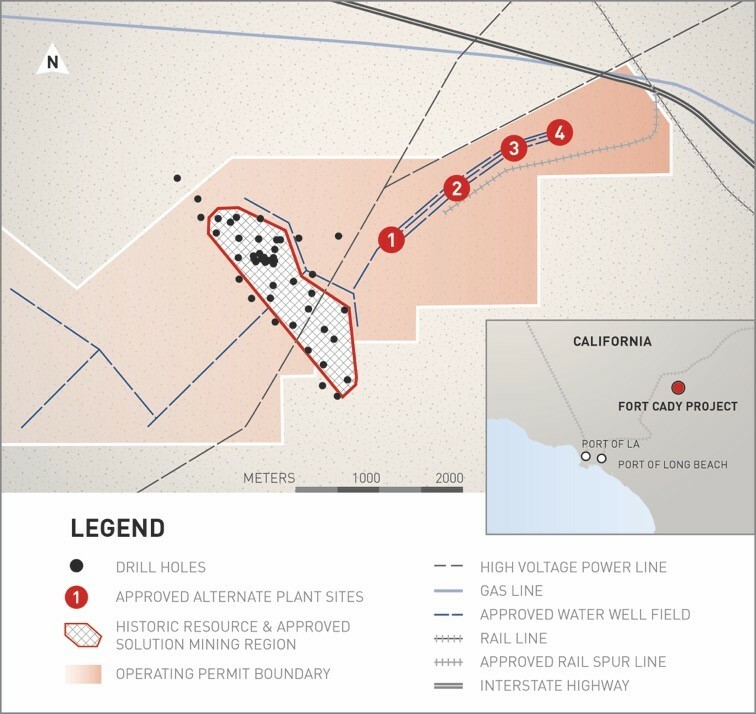 There is a major gas pipeline also running along this infrastructure corridor and the main electricity trunk line owned by Southern California Edison runs directly through the project area. The area is served by Barstow-Daggett county airport located just 20km away from the project site, on the way to Barstow. The two busiest ports in the UA are in close proximity to the Fort Cady Project. These are the port of Los Angeles and its sister port Long Beach. Figure 9. Highlighting existing and permitted infrastructure. The Barstow area is currently experiencing a high unemployment rate. Phase 1 project construction is expected to take nine months and require approximately 76 workers. The project is expected to employ approximately 80 full time workers during the operational life of Phase 1 of the project, approximately 65 of whom would be from the local area. Most of the workers, with the exception of skilled engineers, geologists, and the operation manager, would not require specific mining-related skills; in-situ mining equipment (pumps and other related machinery) can be operated by local trained workers, and no prior experience is considered necessary. With approximately 80 employees, the Project would be one of the largest manufacturing employers in the immediate Barstow area. In addition, the project would not only be a source of wages and salaries for local residents, thus adding another source of personal income to the local economy, but also the construction itself would require various goods and services from local suppliers. Sales taxes on these purchases as well as those on taxable retail purchases of project personnel would accrue to city and county governments. The proposed action is expected to result in local governments experiencing a small but positive cash flow, as revenues from sales and property taxes should exceed the incremental costs of providing public services to the project. Recovery of a valuable resource from the site which will contribute to the state and national economy. The information on this website that relates to Exploration Targets, Exploration Results, Mineral Resources or Ore Reserves is based on information prepared by Mr Louis Fourie, P.Geo of Terra Modelling Services. Mr Fourie is a licensed Professional Geoscientist registered with APEGS (Association of Professional Engineers and Geoscientists of Saskatchewan) in the Province of Saskatchewan, Canada and a Professional Natural Scientist (Geological Science) with SACNASP (South African Council for Natural Scientific Professions). APEGS and SACNASP are a Joint Ore Reserves Committee (JORC) Code ‘Recognized Professional Organization’ (RPO). An RPO is an accredited organization to which the Competent Person (CP) under JORC Code Reporting Standards must belong in order to report Exploration Results, Mineral Resources, or Ore Reserves through the ASX. Mr Fourie has sufficient experience which is relevant to the style of mineralisation and type of deposit under consideration and to the activity which they are undertaking to qualify as a CP as defined in the 2012 Edition of the JORC Australasian Code for Reporting of Exploration Results, Mineral Resources and Ore Reserves.